You'll find a football field at Le Paradis campsite. Want to explore? Le Paradis campsite could well be for you. Want to have a closer look at Le Paradis campsite? If you think Le Paradis campsite in St Léon, Dordogne is the holiday park you, why not have a closer look, and check out prices and availability. Le Paradis campsite family holiday park has 213 pitches. Eurocamp have family holidays parks all around Europe. 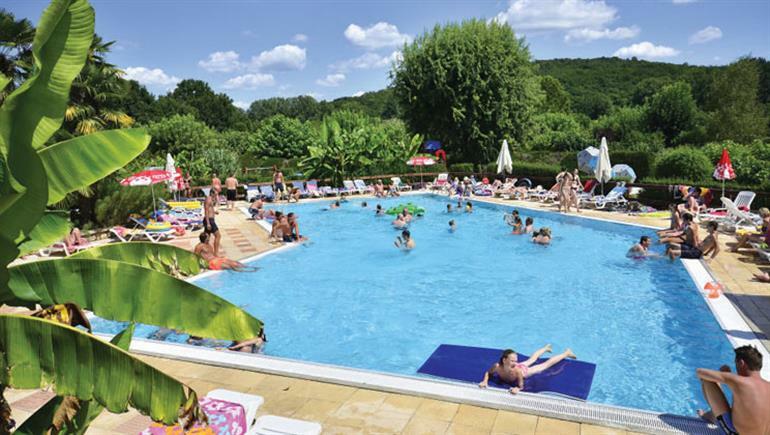 Le Paradis campsite (DR017) is just one of the family holiday parks in St Léon, Dordogne, France. Have a look for other holiday parks in France. You can also see what other people though with the reviews of Le Paradis campsite. These are the reviews for Le Paradis campsite. There are 143 reviews. Beautiful parc kept well by everyone who works there as well as the respectful guests. Wow, this campsite is so well situated to see so much of this beautiful and historic area, with major history right on your doorstep. A picturesque, botanical garden, campsite with excellent facilities and very knowledgeable and friendly staff and some of frances and mans major history within a 40km radius you will not get bored. The adult couriers sue and rodney help to make this site one of the best we have visited and our holiday pleasant and relaxing. They make eurocamps presence at le paradis top grade. Prior to their presence it was little different to many others we have used and have not been inclined to revisit. Lovely parc, good emplacements. Plenty to see in area. Weather meant we didn't use pools and as we were near end of season, on-site shop was low on some stocks. Couriers rod and sue very helpful, even providing the welcome packs that our overnight stop where the packs were ordered couldn't (said they had run out). Very quiet site, rather remote (for places within walking distance). beautifully laid out. Excellent park, beautiful flowers, herbs to pick and eat. staff friendly and helpful, site staff and eurocamp staff. Have been to this parc many times. it is our favourite. every time we go there is something new. It was good to re-visit old haunts. On arrival rodney the rep was extemely hospitable and informative, we have been on other eurocamp sites and the le paradis is the best site so far. The shower/toilet facilities were excellent and the whole site was maintained to a high standard, had a lovely stay. Le paradis is one of the best parks we have stayed on. Great 10 days at le paradis camp. it's a very smart well kept camp site with all the facilities we needed. not too large to lose yourself or the kids in with plenty to do in the surrounding area for trips out. we had a eurocamp safari tent which was ideal for 4 with plenty of room or kit. sleeping 6 was possible but would have had daily logistics of putting temporary beds away each morning to free up the kitchen area space. restaurant at the site was good and shop and fresh bread each morning really welcome. would happily go there again. Holidays at le paradis just keep getting better and better. cant wait to go back!!! Excellent but did not enjoy the on site restaurant which you had to book on an evening. This was our first ever booking with eurocamp after years of package holidays, and we enjoyed it. The le paradis park was very pretty with lots of beautiful flowers and a friendly atmosphere. The pool area was great, as was the bar and the children's play area. Loved the herb garden and the children's disco. The pitches did feel quite squished together and, with one main track through the centre of the park, it meant that all the cyclists, cars, pedestrians and go karts went down that one road. This didn't always feel that safe. Great location with lots to see in the area. Amazing holiday and would be glad to come back and do all again. The park is as good as a 4* hotel. food in restaurant is top class, staff are very friendly and the eurocamp caravan was perfect, with a lovely sheltered garden. The parc was very nice, clean, well looked after. Facilities all clean and well maintained. Staff all very helpful and polite. An excellent site with lovely facilities in a great location. We had a wonderful time. The parc was lovely and the facilities were great. I have scored 8 out of 10 as it was not a five star hotel but as campsites go it must be at the top end, although some have more facilities/entertainment, hence not 10 out of 10. A well maintained parc. Beautiful gardens, lots of space and good pools for the children. The area is very beautiful with lots of small villages to visit. The parc was well maintained and had beautiful flowers.there was a lot of activities for the kids and the pool complex was really great. St leon is a lovely french village and the surrounding countryside is picturesque. Canoeing down the river, visiting the lasaux cave paintings and many chateaus nearby kept us entertained off site too. Had an fantastic time and would consider returning. This is a great park in a great area. The only slight downside is the restaurant is very ordinary and expensive it was much better with the old chef. I still think this is one of the best campsites. I have been to. St leon is one of the best sites in the dordongne. Very well organised and manicured site with a pristine new pool complex. The owners are very proud and helpful and it shows in every aspect of this site. I particularly liked it when the chef introduced himself and talked us through the restaurant menu. The kitchen supplies the restaurant and does a takeaway service but please note that it's a proper french kitchen so you won't get any fast food here. . this is a truly outstanding site set in a beautiful location. This was our third visit to le paradis after approx 6 year gap. Parc as wonderful as ever, slightly disappointed with the somewhat tired eurocamp equipment and that the accomodation hadn't improved more but still a great holiday. Beautiful well kept site, lovely area with canoe hire available from site. big pitches, though only half occupied in june. tent huge for a couple, would be cramped with 6 in though! The parc was fine apart from one detail which became very annoying for several guests. . you had to book a table for dinner the day or many hours before or they refused to serve you. Very poor, as many people do not plan ahead on holiday, this is part of relaxing on holiday. Not having to plan. Great site, spacious plot nice and quiet. Pool complex lovely. Le paradis is certainly best site we have visited. Owners take obvious pride in their business. The restaurant has to be visited for superb evening meal. 5 star. Lovely friendly venue, with great facilities. Overall a very pleasant holiday. Very peaceful and well kept surroundings. We had a fantastic holiday on this 5 star parc. everything was perfect! Lovely holiday. Beautiful scenery. Loads of places to visit. Excellent site. The cabin in which we stayed was comfortable and roomy. the shop was well stocked and the restaurant food tasty and well presented. the camp site was well laid out and in may, was quiet which is why we chose this month. We had an excellent holiday marred only by a last minute change of travel arrangements due to a strike at caen. not your fault, but it did entail a lot of extra driving. Fantastic parc with owners who actually care. They have now employed a professional chef. The food in the restaurant is now perfect. The chefs wife made an apple pie that had the best pastry i've encountered. Were missing the site already. The bar man antony was excellent as front of house. The owners should ensure they keep him employed as her very good at his job. He lifts the atmosphere to a new level. This was our first holiday with eurocamp and we were very impressed with the camp and the couriers. it was a very friendly place and in a wonderful location. Eurocamp reps were friendly and helpful. the site was beautiful and well kept. a good, small parc with plenty for the children to do. 2 outdoor pools were still closed as they aren't heated which was disappointing. the shower in the caravan was not good, however the showers at the indoor pool were good so we showered there. The restaurant was fantastic!! all the staff worked hard to make our holiday special. Great family holiday, great parc, friendly staff, beautiful location. Great welcome pack and complimentary drink on arrival. We had an absolute fantastic time. The location is idyllic and so quiet. Only interrupted by birdsong in the morning. . . we used the pool which was clean and a nice depth with a area perfect for youngsters. . . the shop is fine. Order your bread and croissants for the following morning and enjoy sat outside your accommodation. . . we used the restaurant on numerous occasions and every time it was a treat. The chef is fantastic and is happy to chat with you about the produce and its source. . . the barman and pretty much manager of bar/restaurant who is called anthony, truly is in a class of his own. Extremely knowledgable, polite and can't do enough for you. Make sure you visit the bar and sit out in the suntrap courtyard for happy hour! 17:00-18:00 everyday. . there are some breathtaking places to visit on your doorstep . enjoy! Excellent! my husband, I and my 2 year old sob absolutely loved it. We went ar the beginning of the season so it was perfect weather for us especially with all the walking we did. The parc was very clean, and a lovely place to spend our easter holiday. Would definitely go back and would highly recommend. Could not fault in any way. We have been coming to this site for many years: the site remains open longer than eurocamp uses it for. despite the weather being cooler at this time of year, we would stay longer if the site was available. Lovely parc, lovely area, nice and quiet. This was our first time we used eurocamp. The feedback from other people who had been on eurocamp holidays year after year was positive. Le paradis is probably the best campsite we have visited in the last 20 years. This is our 4th visit in the past 6 or 7 years and it still maintains its number one slot in our affections. We called the site "the kennels" as it was full of dogs. We were disappointed with accommodation pitch, we stayed in safari tent for 1 week, the pitch wasn't big enough for us to sit outside and have bbq without moving the car somewhere else every day, there was only enough space to park car directly in front of tent long ways, all the other campers were squashed into their pitches no privacy at all. Tent was not as well equipt as when we had previously stayed in the same model, missing, mostiqueto nets, bbq utensils, cool box, blankets etc.,. our other stay was better in the summer when we stayed with eurocamp at st avits loure 20 miles away, pitches well spaced out not enclosed, tent full equipped etc. We will not be returning as we didn't feel comfortable with the pitches, campsite however had lovely swimming complex and sports facilities for children, however majority of campers had brought dogs with them so could be a bit noisy at times. Amazing holiday in a beautiful location. This was our 5th stay at le paradis - each holiday arranged by eurocamp. We always have a superb holiday and hopefully this wasn't our last ! Fantastic park, clean and secluded in a beautiful part of france. Spent the morning going on day trips and the afternoon by the pool. The restaurant on site was brilliant and definitely worth a try. Considering going back next year. This is a beautiful campsite, immaculately maintained and wonderful for those who appreciate a quiet, peaceful location rather than an action-packed rowdy one. We have had a fantastic holiday! it was our first time camping. The staff and park made it a wonderful experience. Everyone was so friendly and the park was so organised. We were allowed to check in earlier than expected and felt so welcome throughout our stay. The park was clean and fresh. We would definitely spend our holiday at the park again! This was our 1st family camping holiday and was just fantastic. The parc was spotless and just beautiful. Our tent could have been clean on arrival with food wrappers found from the previous guests. The parc restaurant wasn't great, we were served very burnt food one evening and when we asked to change it, the waiter was rude. But these two things were very minor, we had an amazing holiday and I have already recommended this park to all my friends. Superb site, clean, lots to do for the kids - recommended! We loved the feel of the park and the safari tent itself but were a little disappointed at how close the pitches were crammed together. .
Amazing parc, couriers who went above and beyond the call of duty, very efficient and helpful booking service. Will definitely do again. We had a great time, we were also lucky with the weather! site is really clean, quiet and well maintained, being able to canoe to your campsite is fantastic. Lovely parc. Perfect size and great facilities. We had a great time with the safari tent, and parc was really excellent, we'll definitely be back. Lovely parc, beautiful location, hope to go here again. An excellent holiday. loads to do locally - or can stay on site and still be occupied. an efficiently organised park, well maintained, friendly staff who speak multiple languages. The campsite is very well kept and beautifully presented, but pitches are relatively small with very little privacy. the majority of the campers were from holland (campsite is dutch owned), which makes the overall feel of the campsite not very 'french'. also very busy on the site. Excellent parc, fantastic camp staff with very helpful owners and family. Lovely countryside and lots to do. Weather not quite what we expected but that's a chance you take going anywhere. We loved it! the park was very clean and well cared for. there was lots to do on the park too. We felt more than a week and we would have struggled to find things to do with our 3 children if the weather hadn't been good. our children didn't want to join in with the camp activities as they were speaking dutch. they did speak english but our children felt in the minority. I would definitely recommend this park! Great hol. parc was lovely though we could have done with the grass being cut etc. mobile home was a little disappointing v others we have stayed in with other companies. A beautiful campsite. More like living in a botanic garden. Very helpful couriers, camp staff were also great. We have been to a number of campsites all over france and have enjoyed them all. However we will definitely be coming back to this one. Do not consider if you want lively, noisy or wild entertainment. This is peace and quiet and a fantastic environment. You will not be disappointed. This campsite is france's best kept secret with two of the best couriers that we have been privileged to meet. Absolutely fantastic park. The best we have stayed at. Very verdant, restaurant great. The last of the three sites we stayed at, being one we visited for a short stay two years ago and determined to return to. It was certainly up to our expectations and even exceeded them since a new complex of sauna, jacuzzi and heated pool under a telescopic cover has been added. An exceptional parc in every respect. management, cleanliness, facilites, activities, bar and restaurant never fail to please. Beautiful, well maintained park with excellent facilities. Perfectly located with attractions and places to visit in every direction. Staff very helpful and friendly without intrusion. I have been recommending le paradis to everyone I know since the minute I got home.. and a few on the ferry too! The tents are good but at 69 we found it hard to cope with the camping. Side of it if we went again it would have to be a mobile home. But all in all very good. .
Lovely site in a beautiful area of france. Eurocamp reps, rod and sue, were excellent. Overall, a first class holiday. Pristine parc run by a professional family team. Superb location with great facilities, situated perfectly to explore this fantastis area. Excellent couriers in every respect. Wonderful site. Maybe not suitable for families withe teenagers. Couriers performed their job but were not outstanding. Short 3 night stopover this year. lucky to arrive on thursday evening to enjoy the music of a very talented guitarist and singer. great fun and surprised ourselves by dancing after a long journey!!. . great improvements - new tent was fantastic. quite magical in the early morning sun. yes, we did see a bit of sun. thank you to all at le paradis. Brilliant holiday. Already booked for next year!!! Excellent 6 days. Mobile home was great and extremely clean, park safe for kids (15 month old loved it), daughter also loved the natural garden they have with strawberries and raspberries, our section was private and large with table chairs and bbq outside our front door, 3 pools outdoor, plenty to do at camp and within 30km of site and friendly staff. My only complaint was no expresso coffee on the camp, picky I know! Really great location - fantastic site - everything there one could wish for and a really nice vibe. Owners very helpful and everything well thought through. What a lovely area the dordogne is - truly breath taking!. great parch, excellent accomondation. Parc is clean, beautifull, the perfect size for families with young kids!. loved the things we had access to, great restaurant, lots of activity from canoing to pool, children animator, evening events. An excellent holiday in a lovely location. Le paradis is a brilliant camp. We had a lovely shady pitch on a very pretty picturesque park. This was only one of the campsites we stayed at this year but was definitely the best. Lovely campsite. Better than expectations and photos don't really convey how lush and green it is or its beautiful setting. We asked for shade and were given a pitch that met our needs. Very well maintained campsite. Toilets and showers were always clean and really appreciated the beautiful flower beds. We were also impressed with the sensory garden which we made use of. The food and service in the restaurant were of a high quality. Superb courier thanks roddy & susan. My husband and I spent a week here in a eurocamp mobile home. The site is spotless and very beautiful. The mobile home was extremely clean and by the look of things, new for that season. We had a large private garden area with decking and had the choice of sun or shade. We were there at the beginning of july just at the start of the heatwave so it was nice to have some shade. We made use of the pools and welcomed a swim to try and cool down. The pool area is great, a small pool for babies/toddlers, a further pool for young children and then a larger pool. Our only very small point was that in the large pool there were so many inflatables and balls in the pool it was pretty much impossible to swim further than a few strokes. However, there were plenty of sun shades and beds to relax on. We made extensive use of the bar (especially between 5-6pm) happy hour, large beer for small price. We also had a great meal at the restaurant. Food was extremely good and staff were really friendly and polite. The herb and fruit garden is lovely, I regularly popped down to pick fresh herbs to use in our evening meal. Also a mention for the eurocamp reps rodney and sue, extremely efficient and even though we arrived early (11.00am) our mobile home was ready and we were in by 12.00. A very friendly and helpful couple. All in all a great week and would thoroughly recommend this site for families and couples. The only thing we could really find fault with was the lack of shade on the pitch. our courier advised that he had frames for a gazebo but no covers. it was disappointing to learn this as a gazebo would have made all the difference. Pleasant campsite ("parc"), very clean and well-laid out, lacked only in that there were no campsite soirees where it was possible to share eating / partying experiences with fellow guests; (e.g. Bbq with music in what was a lovely courtyard). although the restaurant was ok and the one night of music was very good, overall it lacked conviviality and did not facilitate bringing people together. (we are not talking 'discos' here!). thus, it was a pleasant routine holiday rather than a truly memorable one, unlike previous times at l'eperviere in burgundy or especially at la romieu in the gers, the latter of which sadly no longer features in your catalogue. I think the check out time of 10am is too early. particularly if no-one is coming into the accommodation that day. I think it would help if the courier came around the evening before you left and said that as no-one coming in that day - do not have to hurry - can leave at say 11.30am. then you would feel less stressed. This site at st.leon was very good. however the unit we had at etang de la breche, no to4, needs replacing or maintaining. two of the double glazed windows have misted, the outside light didn't work, the fire didn't work, a light bulb was missing in the kitchen , but worst of all there was old food on the floor under the table and the surfaces were sticky and I had to clean them when I went in. I did report it but nobody came. we were only there in that unit one night, the other unit we had there on our previous visit was ok.
Lovely site with great staff and an excellent restaurant. Beautiful area for walking sightseeing and shopping. Great area, beautiful park - loved the shared garden to pick herbs from! Lovely area to spend a restful holiday, that is when it's not a building site! Loved our holiday, the location, the park and the food! the park is clean, superbly maintained with quality amenities. Our only gripe was the holiday providers allocated pitch, it was bald - no grass left! this in my mind was unacceptable but it was the only pitch available and this became a problem when it barely stopped raining during our stay in june and despite our best attempts we and our 18 month old traipsed mud throughout the tent. This was disappointing but we will be return to les paradis! Simply one of the best site I have ever stayed on! it is a real must to visit, the staff are great, the pitches so well maintained I almost felt bad to turn onto the pitch with the car. great couriers and the on site facilities are just amazing. that's even before we get to the location which is just perfect too! La paradis was excellent, especially when compared to our overnight stay location in the loire, where the service of the couriers was poor to say the least. The site was lovely, beautifully maintained, family members and staff were very amenable. It was a pleasure to wake up there and return there after being mesmerised by the sights in the locality. Unfortunately, we had really bad weather, so we were cold in the safari tent, the little bar on the site closed early on an evening because the park was quiet due to the weather. again due to weather no evening entertainment so, we were left cold with not much to do on a evening, not great with 2 teenagers. if the weather had been hot, it would have been excellent. Lovely parc, well run and clean.helpful couriers and friendly parc staff.overall a great holiday even with the rain! 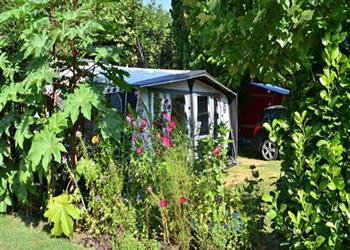 Le paradis is a beautiful park set amongst gorgeous countryside with welcoming and friendly staff. we thoroughly enjoyed our time here - it would have been great if the weather had been kinder to us, however there is plenty to do around the area rain or shine. the site restaurant is a gastronomic delight, the waiters were excellent at providing recommendations with both food and wine and jean-michel(the chef) is not only an amazing cook, but provides cookery lessons every friday as well! la roque st christophe (4 mins drive away) is a fascinating historical experience not to be missed. Lascaux caves also within easy reach. Disappointed we couldn't try out the canoes (inclement weather), but will definitely return for another visit - thoroughly recommend this site. Pity the weather was so cold. Otherwise an enjoyable holiday. A wonderful break despite the lack of sunshine sunshine and given a bit of glamour by our fabulous safari tent. Le paradis is just that - paradise! an immaculate camp with incredibly friendly staff and wonderful accomodation. . cannot recommend it highly enough. Will definitely be back!! Good eurocamp couriers and vans, due to pitch size and open location. Unfortunately the campsite restaurant is shockingly poor quality and the wines served are cloudy due to being from a barrel that is sediment spoiled from age or cheapness. Wite, red and rose all cloudy. Reps were more thsn aware of this issue as we had informed them last. september. Campsite owners and also chefs dogsvjust run wild. Black the chefs dog is also aggressive and not supervised. Really bad situation when campers have a dog with them and on a lead st thrir pitch. Totally unacceptable. Cannot fault the accommodation, and facilities therein. first time in a mobile home for perhaps 30 years, and really impressed. our encampment was large and very private. Only the weather could have been better. Overall experience excellent. We have been before and will go again. Lots to do and see and super park. Weather not very good. Great parc, friendly couriers, just poor weather! Very lovely area, great personal welcome from couriers sue and rodney and campsite owners.